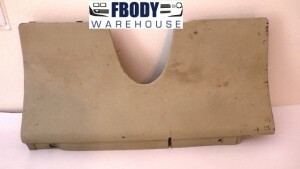 1970 - 1981 Trans Am Lower Dash Plate GM Many GM Colors to Choose From! Use the drop down menu below to select various colors in stock and preview colors as well. Inventory does rotate so check back if the color you desire if not in stock..
Units will have good lower mounting tab holes and at least 2 of the 4 upper curl tabs in place. AKA will properly mount. We inspect each unit and clean and dust each unit with SEM color and SEM low luster clear coat for a flawless match to your GM color. If you need in another color we do offer a re-dye service also. Use the drop down box to choose your color. Use the drop down menu below. 1970 - 1981 Camaro Trans Am Rear View Mirror W/ Black Backer GM Correct!